Do you have white residue on your counters, dishes and sink? Water softeners are ideal for homes with either city or well water. Hard or untreated water can cause harm to your dishwasher, water heater, faucets, and prompt premature replacement costs. Call Metro Plumbing today to hear more about a whole-home water softeners. Increased appliance life – Minerals in hard water harm the internal parts of appliances such as, dishwashers, water heaters and washing machines. Soft water increases the life of your dishwasher and water heater by reducing calcium buildup; causing them to run longer more efficiently. More enjoyable showering experience – It’s amazing how much more enjoyable a shower can be with soft water. You’ll definitely notice the difference! Cleaner dishes and long-lasting clothes – Soft water will make your dishes cleaner with less soap scum. Fabric cleaned with soft water will feel softer and last longer. 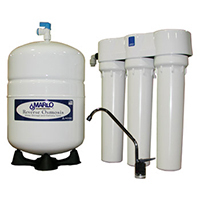 Marlo leads the water softening industry both commercially and residential. Choose from 22,000 grain softener all the up to a 60,000 grain. These softeners come in a single unit model or double unit models. Many of us purchase Brita water filter pitchers, bottled water, or a water filter for the refrigerator. These all work, but nothing compares to a whole home water filtration system. Metro Plumbing will provide Reverse Osmosis water filtration right under your sink. Whole-home water filtration systems remove taste odor and any minerals or chemicals that could be in your water. Call us today at (651)766-8686 or fill out our form online to schedule an appointment.